Give us more!! 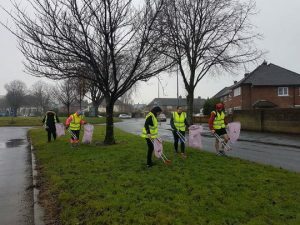 After a damp and soggy Cardiff Park run, 13 GoodGym Cardiff runners wanted more! More distance to run and more good deeds for that January challenge target. So off we set running just over a mile to the Llandaff North and Gabalfa Hub for a litter pick. It’s all about the rubbish! After a health and safety brief, (including don’t try to litter pick each other) and group photo outside the Hub we were off like a regiment heading into battle armed with our litter pickers and pink plastic bags. Most of us paired up to tackle a particular side of the street and others took on the grassy part down the central reservation. 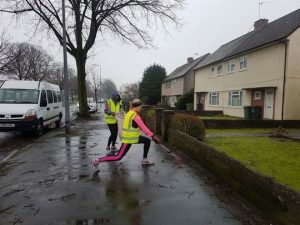 To make sure they got a full workout during the task, Fiona and Lucy threw in some lunges as they collected their litter (see the photo evidence) and trainer Ben seemed impressed with their dedication to keeping fit. Darren, continuing the theme from his litter pick run to Grangetown Hub on Thursday night, counted the number of cigarette butts he collected….litter-ally 475!. Good going Darren! He also came across a Hulk beach towel and took his own photo entitling it ‘Hulk smash’. Aimee and Ellen meanwhile stumbled across three empty bottles of vodka (which they claim they found and did not drink themselves over Christmas) As bags began to fill with all kinds of items (including part of a car exhaust found by Nicola) we looked ahead down the street and saw a tribe of litter pickers coming towards us. 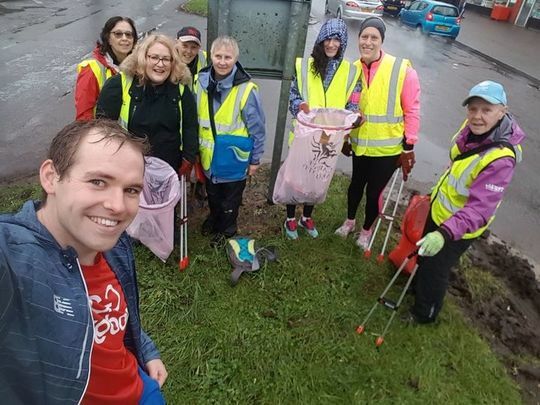 On having a chat with them and after some introductions, it was determined that they were volunteers from Keep Wales Tidy and they were thrilled to see us joining them in helping to get the streets of Llandaff North spick and span. After a half hour blitz of our designated streets, it was time to head back to the warmth of the hub to have a look at our haul of litter. 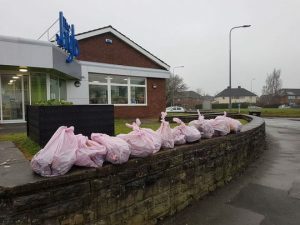 We had collected 10 bags of litter! Jen was really thankful to us for coming along to help out and improve the local area. Onto the next… Still wanting more, the runners headed inside the Hub for a 5 minute break for a quick trip to the loo and to get signed in ready for group run number 2 of the day……. 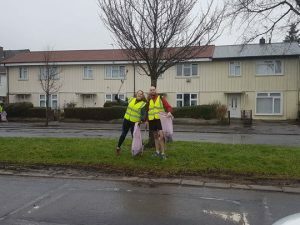 There is no stopping GoodGym Cardiff! !